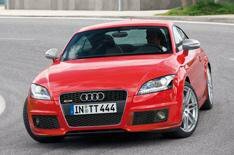 First image: Audi TTRS | What Car? This computer-generated image shows how the top-of-the-range Audi TTRS could look when it is launched in late 2009 or early 2010. The car is currently under development, but reports suggest it will be powered by a 3.2-litre engine with 340bhp, making it comfortably the most powerful TT derivative on sale. It will also make it more powerful than the BMW Z4 M coupe, which it is set to rival. As with the 268bhp TTS, which is due to go on sale later this year for around 35,000, buyers will have the choice of either a standard six-speed manual or a seven-speed version of Audi's S-Tronic double-clutch gearbox. Four-wheel drive will be fitted as standard. The TTRS is expected to cost from 45,000.